1. Thanks for your time. What can you tell me about your project called Dead Sea Apes? How did it all started and what are some of your inspirations? We got together after all replying to an advert, so we didn’t really know each other beforehand. 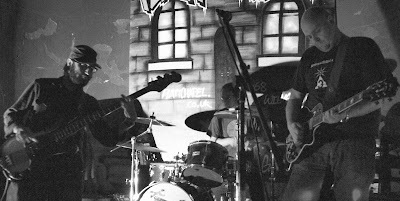 Both Nick (Harris, bass) and Chris (Hardman, drums) had met earlier and had a few jams, but couldn’t a suitable guitarist. I was in another band where the other member wasn’t doing much anything, so I started looking around for something else to do. It was quite strange when we first played together because we improvised everything on the spot and there was an instant chemistry. From that session alone, we managed to get the beginnings of 4 songs. It was kind of our Rosetta Stone for a while. When we got together, we were all massive fans of bands like Can and Neu!, so we kind of thought we’d end up sounding a bit like that, but it took its own direction. We all have our own different tastes that overlap. Personally, I’m a huge fan of psychedelic music from all era’s, especially some of the bands who are around now, for example Gnod, Mugstar, Kogumaza, Carlton Melton, AMT, Barn Owl, Magic Lantern, High Wolf…There’s so many good bands around right now. I’m also a huge fan of Eddie Hazel-era Funkadelic, Neil Young, Jack Rose, Sandy Bull and J Mascis who are all massive inspirations to me as a guitarist. Both Chris and Nick have very wide tastes. I know Chris is especially a big fan of Julian Cope, Beefheart and Zappa, and Nick loves Shellac, Autechre and allsorts of other good stuff. It’s great being in a band where there is so much music to share. 2. When did the project started? We started back in 2009. It took a while for us to take off, as we originally considered looking for a singer. It became increasingly inevitable that we would eventually end up an instrumental band, so we kind of gave up on the idea of a singer after a while. We released our first EP in December 2010 and we got some really nice write ups from it from blogs and radio shows and stuff. For one reason or another, we didn’t do too much for the early part of 2011, but we’ve managed to pick up the pace since. Well, I guess it just goes to show that all the good names are already taken! It took a while to find a name we were all happy with. In fact, we just had to make a decision after a while because it was becoming plain embarrassing not having a name. We came across the name Dead Sea Apes whilst looking through a list of mythical creatures. It actually comes from the Muslim mythology, and the Dead Sea Apes were a tribe from the Dead Sea who ‘turned their ears away from God’ and were transformed into apes. I really liked that when I read it, and thought it would be a great band name. I love the name now. 4. You have new album out. What can you say about it? What’s the concept behind it? We have a few releases on the horizon, actually. We have a full length EP/Album coming out on a US microlabel called Deep Water ( http://www.dwacres.com/label) that’s run by a guy called Kevin from a band called Evening Fires. Some of their stuff is really great, too. Its going to be called ‘Lupus’ and that came about from improvising with loops and live sound manipulation and recording live jams. After the initial recording sessions, we added bits here and edited bits there. We’re all really big fans of Can, and we liked the way they used to do really long jams, and edit the bits together that they liked, so that was the inspiration for that. It’s actually come out sounding much better than I ever imagined. In fact, It’s my favourite thing we’ve ever done. It’s really dark, moody and oppressive. I think that’s due early next year (2012), now. Keep your eyes peeled for that. We are also doing a cover version of Alexander ‘Skip’ Spence’s ‘Land Of The Sun’ for Fruits De Mer’s ‘Keep Off The Grass’ compilation that is due to come out in mid-december 2011, too. We’ve enlisted Canadian singer/songwriter called Gabriel Minnikin to sing on it. He’s got a lovely deep, gravelly voice that suits it perfectly. I’m really excited about that. I’ve always wanted to do something on vinyl, and its such a great little label. 5. Do you have any future plans? We’ve done some of the recording for our next self-release EP, and that’s going to be called ‘Astral House’. That should be ready by early next year. Aside from that, I hope that we’re going to do a lot more recording and releasing. If anyone wants to release anything of ours, especially on vinyl, please get in touch. . We’re also open to do some split records with some bands we like and stuff. We also want to play live more too. 6. When are you coming to my home country, Slovenia? We’d love to come to Slovenia. If we can get the time and the money together, you can expect a knock on your door, Klemen! 7. Would you like to send a message to It’s Psychedelic Baby Magazine readers? Absolutely! Keep supporting Its Psychedelic, Baby Magazine. Klemen’s doing a great job!